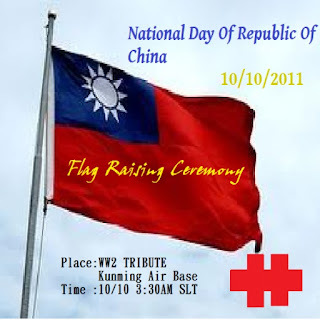 Republic Of China National Day is commemorate Wuchang Uprising which happened on 10th of October, 1919. Wuchang Uprising was the beginning of the 1911 Revolution, and after two months, China's revolution had a great success to overthrow the Qing Dynasty and established Asia’s first republic, Republic Of China. This year is the 100th National Day. There will be a Flag Raising Ceremony in the WW2 TRIBUTE Kunming Air Base. 2.Wear formal clothes. Such as suits for men. Army Uniform is also allowed. 3.Please respect the ceremony. Keep quiet during the Flag Raising. And please look at the flag. 4.Admins have the right to kick or ban people who show their unrespectful to the ceremony or breaking the sims rule.